Orbiter Complete Swing Set Introducing the all new Orbiter Swing Set that combines the Strength of Wood with durability of plastic. 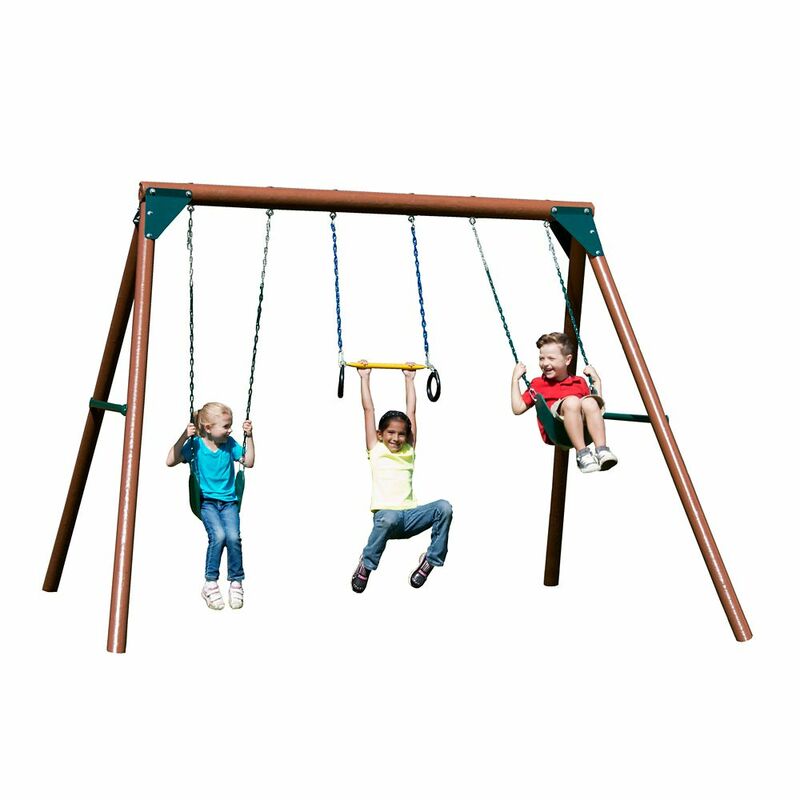 Made from low maintenance wood guard with UV protected plastic encapsulation, this swing set is heavier, stronger and more stable than comparable metal swing sets. The swing set includes everything. Wood guard posts, all swinging accessories, hardware and fasteners and fully-illustrated instructions. The Orbiter comes with a 5 year warranty and is adheres to ASTM's guidelines for safety. Orbiter Complete Swing Set is rated 4.7 out of 5 by 96. Rated 5 out of 5 by Nana from The swing set was relatively easy to assemble and the Grandkids love it! The swing set was relatively easy to assemble and the Grandkids love it! Rated 5 out of 5 by Sadie from The best decision I ever made!... The best decision I ever made! Rated 5 out of 5 by Nancy from We are very pleased. The kids (ages 3-6) love it.... We are very pleased. The kids (ages 3-6) love it. Handsome and sturdy. Did not put it together ourselves but it was assembled in less than 2 hours. I'm looking for a small swing set for my 8 year old daughter! Would this set be adequate for an 8 year old? Orbiter Swing Set has 3 swing positions. Each swing has a weight limit of 115 LBS. Design for ages 2 through 10 year olds. Yes, this should work fine. Just to be clear, since we'll be squeezing this in to a bit of a tight space: I'm assuming the assembled width of 96&quot; is along the dimension of the three swings side by side, not along the dimension of swinging back and forth. Correct. The Orbiter will need at least 6' in front and 6' behind the swing to allow for enough room.